I will answer the second question first: NO! Manipulation of DNA, the creation of life..? that should be left to mother nature. Obviously people don’t remember JURASSIC PARK. 1993 may have been a long time ago, but the lessons of a simple Spielberg movie should never be forgotten. Now to the first question. 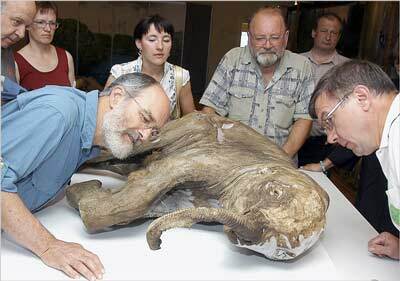 The speculation over the return of the mammoth has begun because a well-preserved mammoth has been discovered in Siberia. Even more: The discovery is coupled with liquid blood.. That’s right: The ice age giant has been found in Sibera with blood and muscle tissue trapped in ice. According to reports, such as this one on RT.COM, researchers broke the cavities with a pick and liquid blood came flowing out. This is a pretty big deal.. Like, beyond a big deal..
Reports conclude that the blood was placed in test tubes.. And .. well, the rest may be history once over-achieving scientists get their hands on the new found old life. But now comes the tougher question: Now that we discovered liquid blood and have wonderful scientific abilities to clone and create, should we? I answered that with my own opinion above. But you’re free to opine.. I’d love to hear your thoughts ..
Just because we may possibly be able to bring the big mammoth back, does that automatically mean we should? Send me your comments on email, Tweet me, or leave a comment on Facebook..